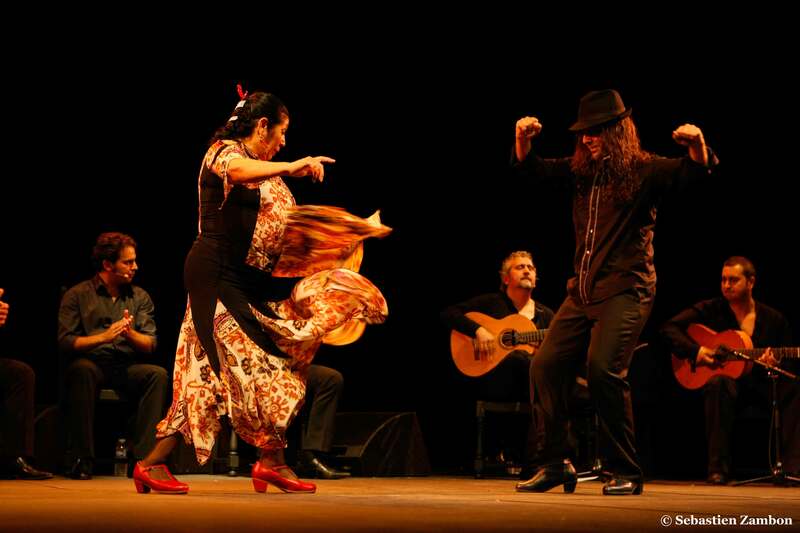 Originally flamenco was born as music and poetry, but soon it also became a kind of dance. 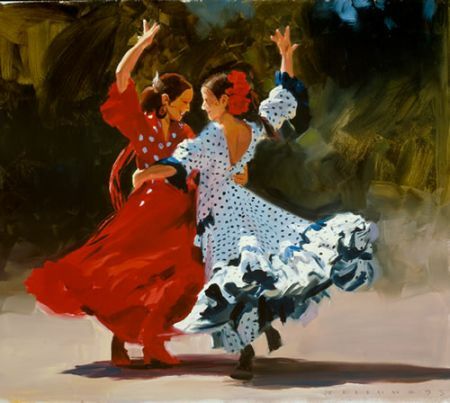 The native region of this sensual dance is the Autonomous Community of Andalusia in Southern Spain where Gypsies settled down after escaping from Greece in 1425. Notwithstanding the laws against this ethnic group, Gypsies always found support among the poorest social strata and they never gave up their artistic inspiration, despite the laws introduced by the Monarchy of Spain, until they became the best interpreters of the Spanish folklore. 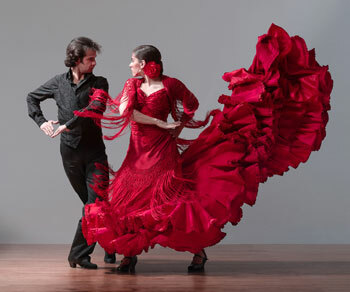 In fact, they learned all the kinds of Andalusian and African dance forms, mixing Arabic, Southern American and Jewish music styles as fandango, jaleo, seguidilla, guineo and guaracha with sensuality and pathos so typical of flamenco. It is a pure Andalusian phenomenon and therefore not influenced by foreign music styles. Gypsies created it by combining Andalusian culture with other philosophies. But a fusion of these theories would be more plausible. 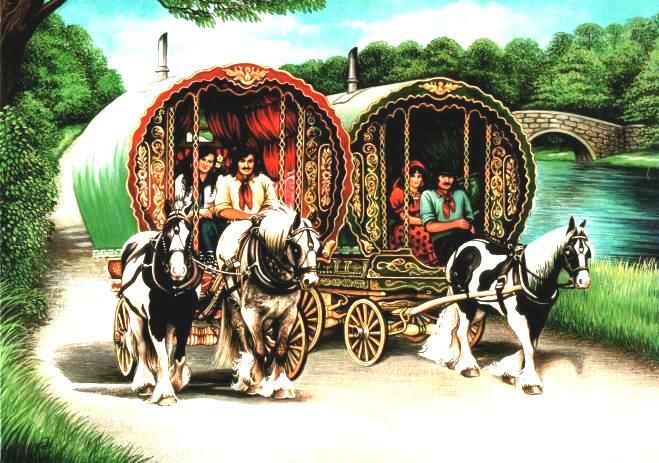 Gypsies would have integrated themselves with the Andalusian inhabitants, who had been reduced to poverty due to the Spanish government. This common condition would have facilitated their integration, although the Spanish government fostered discrimination inside the population, by enacting laws against the Gypsy people. Enjoying life’s little pleasures such as music, wine, sing, dance etc. A strong sensuality that can have a holy or profane halo, depending on the context. Initially, flamenco was just a private phenomenon, born in the slums as the only safety valve of the outcasts. The Gypsies were forced to express their art in secret, due to the Spanish government’s persecution which continued until 1759, year in which the new king, Charles the Third of Spain, started a process of modernization and Europeanization with the appearance of academies, schools and the circulation of all the art and cultural movements. Moreover, with the Pragmatic Sanction issued in 1783, Charles the Third gave to Gypsies freedom of moving and cultural expression, so at last they could express their art and dance openly. This is why it would be erroneous to define flamenco simply a dance. 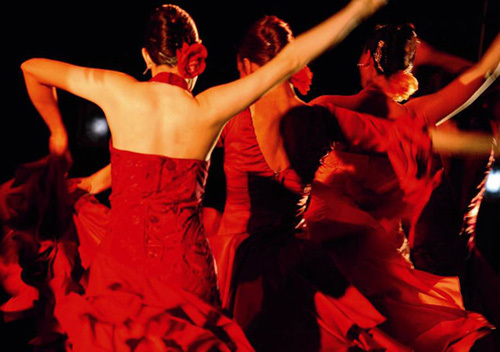 Flamenco is pain, passion, sensuality, desire, tears and making your life…a work of art. Thank you for your comments! If you visit me again, you will read new articles! Meanwhile, you can follow my blog on Facebook or Twitter! There will be a lot of surprises! I think I have got a problem with spams because everytime that I receive a comment it is classified as a spam and I have to approve it if I want to see it on my wall. Is it the same for you? I browsed. And after this post Flamenco: not only a kind of dance � Gitans’ Culture. I was actually excited enough to drop a comment 😉 I actually do have 2 questions for you if you don’t mind. Could it be only me or do a few of the responses appear like coming from brain dead individuals? 😛 And, if you are writing at additional social sites, I’d like to keep up with you. Could you list the complete urls of all your shared sites like your twitter feed, Facebook page or linkedin profile? I am delighted to see all these positive comments and I really thank you! I am spending a lot of time in making this blog and if it is useful for you it is a real satisfaction! I haven’t been a blogger for a long time, but I like to be able to make pretty projects on Internet. My Facebook and Twitter contacts are on my Home on the right. You can add me and follow me (then, if you want to see the blogs that I follow, check on my blogroll on the same page). You will find them very interesting because there are even more news in Italian, English and Spanish. So, join me! I hope to work always well for you. Moreover, I am currently finishing my graduation thesis on this topic, and I am making a video as a summery of my project…so, please, continue to follow me 🙂 have a good day you all. For Christopher: yes, there were responses coming from brain dead individuals, but I am a good-mannered girl, so I have just eliminated it, after reading it with more attention. Please, if you don’t like what I am writing, avoid to be unpleasant. Thank you. Normally I do not read post on blogs, however I would like to say that this write-up very forced me to try and do so! Your writing style has been amazed me. Thank you, very nice article. Thank you a lot and I’m having a look forward to contact you. Will you kindly drop me a e-mail? Very kind from you, Kate. I hope to be always excellent in writing here 🙂 See you soon. Yes! Finally someone writes about White. Hello. I think that this is just a formatting issue, maybe due to Internet problems. However, thank you to tell me about it and to follow me on my blog. See you soon. This type of clever work and exposure! Keep up the superb works guys I’ve you guys to my personal blogroll. this is the first test comment wich i will post on your blog. I conceive other website proprietors should take this internet site as an model, very clean and fantastic user genial design . first of all, thank you all for your compliments. They are a sort of treatment for my self-esteem because sometimes people are very unpleasant and I am very proud to see how many of you like what I write. You have a way with phrases. Outstanding work! for the excellent info you’ve got right here on this post. I’ll be coming back to your blog for more soon. I simply want to tell you that I’m very new to blogs and actually enjoyed your blog site. Probably I’m likely to bookmark your website . You surely come with beneficial article content. With thanks for sharing your website. I just want to say I am just very new to blogging and truly enjoyed you’re blog. Very likely I’m likely to bookmark your blog . You definitely have very good posts. Thanks a bunch for sharing your blog. Thank you all guys…I am not going to repeat what I have said previously, but I just want to say that this is the topic of my dissertation thesis, so I know what I am saying. It has been an hard work of research, and soon you will be able to read it, because I going to post it. Goodbye. I do like the manner in which you have presented this matter and it does give me a lot of fodder for thought. On the other hand, from what precisely I have witnessed, I only trust as the actual feed-back pile on that people today stay on point and in no way embark upon a soap box regarding the news of the day. All the same, thank you for this outstanding piece and while I can not go along with this in totality, I respect your perspective. I just want to mention I am newbie to blogging and site-building and truly enjoyed you’re website. More than likely I’m likely to bookmark your blog . You really have incredible articles. Bless you for revealing your web-site. Thank you all, I am delighted to see how many of you follow me. I hope to see you often commenting my articles. Have a great day! Hi to every body, it’s my first go to see of this blog; this blog contains amazing and really excellent material designed for visitors. Actually when someone doesn’t understand afterward its up to other people that they will help, so here it occurs. Be wary of the posts here on your blog, its nice, but someone might copy it and post it for their own benefit. I’m really impressed along with your writing talents and also with the layout on your weblog. Is this a paid topic or did you customize it yourself? Anyway keep up the excellent quality writing, it is rare to see a great blog like this one nowadays..
feels that you’re doing any unique trick. In addition, The contents are masterwork. you have done a magnificent process on this subject! Cool post . Thank you for, commenting on my blog dude! I shall message you soon! I did not know that! I’m happy that you simply shared this unique helpful info with us. Thanks for any share. I really like this post and will definitely add you to my feed-reader so I can follow you every day. Continue the good work! We’re glad which i found this blog-, exactly the best info i was searching for! . fantastic issues altogether, you just won a emblem new reader. What might you recommend about your submit that you simply made some days ago? Any certain? Well, see, here’s the thing. While I agree with what you’ve said, you could be so much more pursuasive if you could supply more detail and reference. However, we have enjoyed your post, thank you for putting in the time! hey there and thank you for your information – I have definitely picked up something new from right here. I did however expertise several technical points using this website, as I experienced to reload the site lots of times previous to I could get it to load correctly. I had been wondering if your web hosting is OK? Not that I am complaining, but slow loading instances times will sometimes affect your placement in google and could damage your high quality score if advertising and marketing with Adwords. Anyway I’m adding this RSS to my e-mail and could look out for much more of your respective fascinating content. Make sure you update this again very soon.. I wanted to put you one bit of note in order to give thanks again on the lovely tricks you have contributed on this website. It was really unbelievably generous of you to offer without restraint what a lot of people would have supplied as an electronic book to generate some dough for their own end, primarily now that you could possibly have tried it if you ever desired. The smart ideas additionally worked to provide a good way to be sure that most people have the identical dreams similar to my personal own to grasp a good deal more with respect to this matter. I’m sure there are a lot more fun situations up front for people who see your website. Kids Room Paint Ideas Kids Bedroom Painting Ideas For Kids Bedroom. updating all or most of the times kitchens are neglected. ProjectThe minute you start on your next kitchen purchase.